Welcome to Morobinbarrystories.com! Please join me on twitter @morobinbarry. This site is for Bee Gee fans everywhere who would like to share and read stories of fun, love, joy and inspiration for Barry, Robin and Maurice Gibb. (Andy is certainly not forgotten and is included at times). If you’d like to share a story, please email it to me at morobinbarrystories@gmail.com. Stories will be posted weekly, some from my collected tales and some from the new ones as they come in. Others I will save for my book, which is in progress. At times, this writer will post articles about special events and other news relating to the Gibbs. This week’s story is one I got from a long-time fan whose memory is vivid about a special night in her teenage life. I am in my fifties now, but at the age of 15, I was sitting at the concert in Chicago that was life-changing for me. Any fan can watch it on You Tube and see how wonderful the Bee Gees were that night. The Soundstage concert was special for so many reasons, and I remember how impressed I was with Robin’s voice and Barry’s voice and Maurice’s voice and all three of them swept me off my feet. They sang my favorite song, “I’ve Got to Get A Message to You” and then the audience was so impressed because they sang some of the new songs from Main Course, which is my favorite album of all time. Every song was incredible.The brothers were funny, and I was surprised at how they finished each other’s thoughts and acted just like brothers do act with one another. There was something electric about the mood in the audience, and I just was shaking the whole time, so excited and impressed. I was with my older sister, who was mad for Barry. His voice was so strong and he looked so powerful up on that stage with his long legs and amazing hair. I thought Robin sounded like no one I had ever heard, and I fell in love with him, I think. He was beautiful. I also remember that Maurice was sweet and kind to the fans, and I wanted to hug him. That night did it for me. I was speechless on the way home, but my sister gushed and chattered all the way back from the concert about how perfect the night had been. 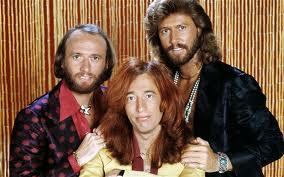 I was hooked forever, and I still love the Bee Gees as much as I did when I was 15. I’ll never forget seeing them and feeling as though they were singing just for me. I miss them together, but I got to see them perform in front of me live. It was one of the most special nights of my life. Anne Jakowenko, the blog author, has been loving the Bee Gees for decades while raising her sons and teaching college students Speech Communication and English skills at her alma mater, Syracuse University, where she received her Master’s degree. She has also taught for SUNY Oswego and Barry University. Currently, Anne is teaching for the State College of Florida while she continues to collect stories for her book, My Life with the Boys. I love these stories! Thank you for sharing such a special time.